You'd be hard-pressed to find a household with children that doesn't have this classic toy at home. For 30 years this car has been delighting children with its easy to maneuver style and open and close doors. Built for children 18 months and up (to 50 pounds), this toy will have them racing around the backyard with their feet (think Fred Flinstone). It also has storage space for bottles, cups and snacks and is easy to wipe down and clean when messes happen. And don't think this will only be fun for little ones, as your tyke ages they'll still get a kick out of rolling and pushing this car around. Hey, even Dad may take a spin! This classic tricycle from Radio Flyer is ready for some red hot action from the toddler set. There’s a removable parent steering handle for those who are still learning to pedal or who frequently lose power and need a push back home. When they’re fully ready to ride solo, though, it can be removed, and it’s all up to them. In the back there’s a bin for hauling toys, snacks or whatever it is they want to haul. You won’t have trouble locating them either, as the trike is equipped with a bell they’ll love to ring over and over again. It’s recommended for kids ages two to five, and the grow-with-me seat can keep up with those growth spurts for years of active fun. Giddy up, giraffe! This ride-on giraffe is just too cute. Kids will love to take it for a spin indoors and out. They simply put their feet on the ground, scoot and go. Recommended for ages one to three and kids up to 50 pounds, the seat is adjustable, so it can grow with them. It helps little ones learning to walk how to develop leg strength, and those already on the go can make it zoom even faster. Some assembly is required, including decals, which let mom and dad give the giraffe spots. The giraffe is not only a cool ride, but also a fun play toy as well. 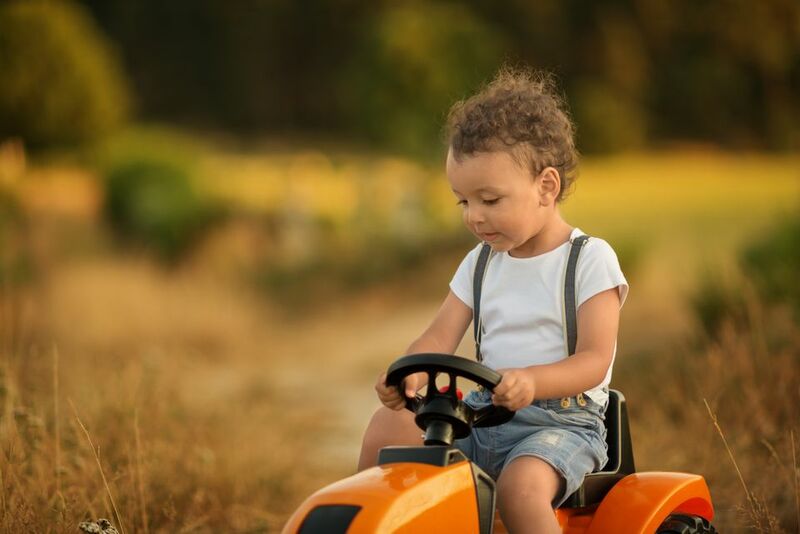 Check out our other reviews of the best ride-on toys for toddlers available on the market today. They say go big or go home, and there’s no little guy or gal who’s going to want to go home when they can ride this tractor into the sunset. There’s a detachable trailer and even an FM radio so they can listen to tunes while they get down to business. This battery-powered machine (a 12-volt rechargeable battery and charger are included) has two speeds — 2 ½ mph or crank it up to 4 ½ mph, and leave the tricycles in your dust. Recommended for kids ages three to seven, it has an adjustable seat, armrests that can move up and down, and you can even put it in reverse to back the whole rig up. There’s also a detachable trailer so they can haul whatever needs hauling. This is one seriously fun green machine. If pink and purple are more their thing then this princess truck may be just the right speed. It’s rugged, tough and ready to work with a flat bed sporting a drop-down tailgate and off-road wheels, but it’s also as pretty as it can be. Details like a gas cap that opens and an electronic horn to toot make it feel like the real deal. While little legs can push it along for a solo ride, there’s also a parent push handle on the top of the roof and a removable floor board to pop in when it’s in use to protect those little legs. Designed for kids ages 18 months to five years, the toddler set will tear things up with this sweet and stylish ride. This mini roller coaster is just the thing for little thrill seekers. It’s their own personal ride, right in their own backyard or playroom. It comes complete with three track pieces that easily snap together and a set of steps so they can climb up to the top before they go soaring down the 10-foot track. There are no terrifying drops, but it picks up enough speed to be exciting for little riders who will want to do it over and over again. The coaster car can also be used separately to ride around the neighborhood or the yard, and the track can be used as a ramp for little cars, trucks and whatever else they want to send sailing down it. You’re on the right track with this train if you’re looking for a toy that will grow with the child and teach them a thing or two along the way. It works in three modes: floor play, walker and ride-on. As floor play, there are all sorts of bells and whistles to entertain your child and help them learn letters, numbers, colors, songs and more. It comes with 13 letter blocks, which can be sent from the train to the carriage via a drop-space as well as a book of letters and an elephant character they can move about. As they’re learning to walk, they can push it along, and when they’re ready to take off, it becomes a fun little ride-on toy that plays music and makes sounds as it chugs along. It operates on three AA batteries, which are included so your little one can get going as soon as it comes out of the box. Wiggle it, just a little bit, and this car is off. Unlike other ride-on toys that you pedal or push, this one relies on a kid’s twists and wiggles. No batteries required; it’s kid power that gets it moving and keeps it going. Kids love them for riding, racing and spinning, and they just may help get their wiggles out. They’re a fresh alternative to traditional tricycles and bikes and a great form of exercise. They work best on flat surfaces and can be used indoors and out. Recommended for ages two and up, they hold up to 150 pounds, and are lightweight enough (less than 10 pounds) to throw in the trunk and take them on the go—no bike rack required.